Men shave, women DERMAFLASH. Men lubricate their skin to soften their beards. Men grow terminal hair on their faces, which is coarse and thick. Women grow vellus hair, which is baby fine. DERMAFLASH was designed exclusively for the sensitive skin on a woman's face. It is performed after using our specially formulated cleanser Prep that gently removes surface oil and creates a dry platform. Dead skin cells and debris lie on top of your skin, and when the oily residue is removed, DERMAFLASH can sweep away dull, lifeless cells and vellus hair more effectively. Inspired by the popular medspa procedure called Dermaplaning, the DERMAFLASH Edge is a proprietary element exclusive to the DERMAFLASH system. It is safe and gentle on all skin types, and effectively improves skin tone and texture without causing irritation. DERMAFLASH is a first in class at-home, patented, safe, hygienic, exfoliating device inspired by dermaplaning, a skin treatment for the face available only in medical spas or doctor’s offices, which refinishes skin by removing dead skin cells and built up debris. The device also gently removes facial hair for smooth, luminous, and rejuvenated younger looking skin. DERMAFLASH was made specifically for women. DERMAFLASH Facial Exfoliating Device comfortably and discreetly sweeps away skin imperfections, dullness, and peach fuzz with a subtle sonic vibration. In just three simple steps, it gently removes dead cells, debris, and fine hair from the cheeks, jawline, lip area, chin, and forehead. It is safe for all skin types, skin colors, and ages. DERMAFLASH immediately unveils smoother, more vibrant, and younger-looking skin in the comfort of your own home. Prep is a pre-treatment cleanser and Soothe is a nourishing hydrator for use immediately after using DERMAFLASH. I'm in love with this DERMAFLASH Facial Exfoliating Device! Not only does the DERMAFLASH Facial Exfoliating Device give me bright radiant skin but it also sweeps away all the peach fuzz that hides out on my face. Since my facial hair is extremely light and hardly noticeable I never really thought about it but now that's it's gone I realize I needed this DERMAFLASH Facial Exfoliating Device in my life a long time ago. Now that the peach fuzz is gone and my skin is exfoliated and healthy my makeup glides on with ease. I truly believe that my skin also looks much brighter now that my peach fuzz is gone because even though it was light it made my skin look dull and my makeup splotchy. My skin feels incredibly soft and looks years younger! 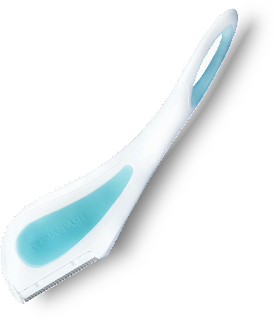 The DERMAFLASH Facial Exfoliating Device is extremely easy to use and the results are amazing! My lotions, serums and makeup work much better and I've gotten so many compliments on my skin! I highly recommend the DERMAFLASH Facial Exfoliating Device! Click HERE to find a store near you that sells DERMAFLASH! Click HERE to learn more about DERMAFLASH! Follow DERMAFLASH on social media!